It was great to be invited to submit a guest post for Diabetes UK's blog to mark Diabetes Week (9-15 June) this year. I'm a little late with it, so it may not make it onto their site this week, but here it is anyway. "What aspect of your diabetes would you fund research into if you had the choice?" Some of you may know I've been pottering off to London every so often recently as part of the Guideline Development Group that is updating the NICE Type 1 Diabetes Guidelines. I'm on the Group as one of two 'punters', part of the Patient and Public Involvement programme that seeks to include a grass-roots perspective from patients during the development of NICE guidelines. As a result I've had a bit of homework to do and have come into contact with a whole stack of research papers on all sorts of topics. I have good reason to be thankful for NICE Guidelines. As a patient, well written guidelines give you a meaty, authoritative document to wave in front of your clinic or GP that says, "Look, this is what the NHS says is the very best way to treat my condition, and that's what I want". NICE prides itself on being 'evidence based' and looks into all sorts of different approaches/treatment options to try to evaluate the very best options in terms of efficacy, balanced with cost-effectiveness. Thankfully 'cost effective' is not a euphemism for cheap here. Even very expensive options, such as an insulin pump, can be recommended provided that the research demonstrates quantifiable benefits to the patient. At the risk of offending researchers everywhere, to my simple mind the research papers I've been looking at seem to divide roughly into two camps. One is 'I wonder what...' and the other 'I reckon...'. The second camp also appears to include studies with a vested interest in demonstrating a particular outcome, sort of 'Can we show...'. It is a good job that published research is peer-reviewed and some considerable effort is taken to ensure that studies are designed fairly, but nevertheless there is a part of all of us, I think, that looks slightly sideways at research into how marvellous a new drug is that was paid for by the company that makes the product. NICE even have a special method for reviewing research papers to assess their reliability 'grade'. So what of my own 'I wonder what...' question? To be honest, it's probably a bit more of an 'I reckon...', but only because of my own experience over the last few of years. I also suspect (given some of the online questionnaires I have been invited to complete recently) that there is already a growing body of work on the subject. Best of all, there is no Big Pharma organisation lurking in the shadows looking to make squillions from a new wonder drug. What would I like to see researched? It is simply this: "The use of internet forums, social media interaction and blogs (the Diabetes Online Community) for improved patient outcomes with T1 Diabetes". Now I'm not for a minute suggesting that posting a couple of threads on a diabetes forum replaces the expertise of dedicated healthcare professionals or attending regular screening or clinic appointments, but diabetes is a frustratingly individual condition and can be quite isolating. Time and again I see new people join diabetes forums, or begin tweeting who have lived with type 1 for decades but rarely, if ever, met or compared notes with anyone else living with the condition. I'm a passionate believer in the power of peer support and have seen its transformative power at work in the lives of many individuals. Successful diabetes forums are huge resource of pooled experience, knowledge and can instantly put you in touch with approaches, techniques and suggestions from clinicians all over the world. Diabetes blog posts that mirror your own experience from another's perspective can give you a real sense of connectedness and help you realise that it is not just you. Conversely, another post might make you realise that anything is possible. Social media channels and interactions provide very genuine and in some cases almost instantaneous support and encouragement when diabetes is not 'playing nicely'. There is a new breed of Healthcare Professional learning to embrace and value these resources, and it would be nice for them to have some good hard research numbers to back up their enthusiasm. Hopefully we can move away from the time when HCPs never looked at online diabetes resources and suggested that their patients never read them. If you are living with type 1 diabetes you are not alone. There are 1,000s of others facing the same daily battles and together we can make each other's days just that little bit easier. It's Diabetes Week in the UK this week and after my rather forlorn post about the apparent disappearance of C8 medisensors non-invasive CGM last week I was pleased to read this little update on the Artificial Pancreas Project (APP) from Diabetes UK today. It's still reasonably early days, and to my mind we are still quite a way off a 'real' management solution, but step by step people are cautiously being allowed to hand over the reins overnight to an automated system in their own home rather than under strict lab conditions with technicians standing by the bedside clutching Lucozade and NovoPens. For those of you who have *no* idea what I am going on about, the Artificial Pancreas Project is seeking to 'close the loop' between two clever bits of diabetes kit. A Continuous Glucose Monitor (CGM) that can measure glucose levels and an insulin pump that can provide varying doses of insulin. In fact most people who happen to see my pump tend to assume that we are there already, and assume that a pump will just somehow 'know' how much insulin is needed and provide it automatically. Sadly it's not quite that easy, and while an insulin pump is a brilliant therapy option it does still require a fair amount of effort, guesswork and to be honest more than a little luck in balancing all of the hundreds of variables involved in day-to-day BG tomfoolery. Part of the problem with the APP of course is that the technologies involved are improving, but still rather less than perfect. Continuous Glucose Monitors make an estimate of blood glucose levels based on glucose concentration in interstitial fluid (the stuff sloshing around between cells in tissue). This tends to lag a bit behind actual BG values, and those lucky enough to have access to CGM will know that what you are really getting is 'trend' information rather than the accuracy* of blood-based fingersticks. CGM manuals/marketing are usually pretty clear that any doses/corrections made should be done after confirming results with a fingerstick test. But the closed loop system needs to use this very same stream of trend information in order to make dosing decisions. Currently the human trials of the APP are showing relatively promising results for looking after things overnight. To know that you had a smart system carefully tweaking your levels while you slumbered would be fantastic, but of course a full Artificial Pancreas would have to go much further and tackle the thorny issue of mealtimes. Personally I think we are a looooong way off that. For one thing current 'rapid' analogue insulins are hopelessly inadequate for the task. They take far too long to get going (1 hour for corrections to start taking effect anyone?) and act over far too long a time period to give a bunch of electronics, however smart, the ability to take over entirely. What I would hope for instead is a commercially viable 'smart pump' which combines much of the effort and user knowledge/experience that currently goes into effective pump use, but with automated AP trickery to take the edges off the errors and irritations of daily pancreas impersonation. A system whereby you would bolus for meals, set TBRs for activity and generally do the basics, but the pump would be constantly monitoring how things were going and have the ability to tweak things and make corrections to keep things on a more even keel. Now that really would be something. * It should be noted, of course, that fingerstick BG tests in themselves are not particularly accurate and only really serve as a general guide as to what is going on. Has the light gone out on C8 Medisensors optical CGM? Someone left a comment earlier today asking if I knew any more information about the C8 Medisensors non-invasive CGM, which was given CE mark approval late last year. Some of you may remember me getting quite excited about it after having seen the device in action. At that stage, the general expectation seemed to be a European launch in the Spring of this year. In January I got wind that the launch had been put back slightly to allow for 'further enhancements' to be made prior to the launch in mid-2013. I've had a little look around the internet, but all I can find are reports/stories from late last year. Trying to look up the C8 folks I met via LinkedIn suggests that they stopped working for the company in January this year. It seems that at about the same time John Kaiser took over reins at the company - so what happened then? With an increasing sense of doom, I realised that their website seems to have gone offline in the past few months too. To be honest, I'm gutted. Just wondering if anyone knows what the story is? I really believe that their non-invasive CGM, if it lived up to the promise shown, genuinely had the ability to completely change the landscape of diabetes care across Europe, and CGM pricing/availability in particular. £2000 for 4 years, rather than £3000-£4000 every year would put self-funded CGM within the grasp of many more people in the UK. A currently frustrated and untapped market. I can't have been the only one waiting for lauch with one hand reaching for my wallet. Anyone from C8 Medisensors out there? The sun is shining... thoughts turn to Summer holidays. This year we will be returning to Cornwall, to the very same place we stayed a few years ago. When we were there before the girls and I quite fancied a little gentle sea-kayak pottering in the wide open bay on our doorstep but never quite managed to bump into the kayak hire people who seemed to have a rather relaxed approach to timekeeping (and attendance in general). This year we are hoping to give it another go. The last time we were there I was on MDI, but this time, of course, I have Artoo to think about. I don't suppose we will be out for very long so I could just detach and leave the pump on the shore. I suspect there will be enough activity involved in paddling to make hypos more of an issue than raging highs, so the lack of basal for an hour or so would probably not be much of a problem. But... what if something happened. The last thing I'd want if anything untoward were to occur would be to be bobbing about awaiting rescue with the added 'excitement' of being just a few hours from DKA once my last bit of basal runs out. 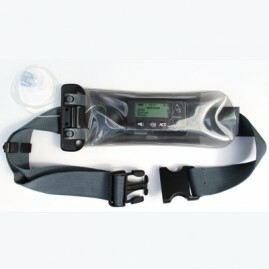 Having asked around I've had very good reports of the Aquapac waterproof pump case, so I've decided to order one. The case is clear so I will be able to check on how Artoo is doing and it's waterproof enough to cope with anything from a bit of gentle splashing to some full-on dunking - for a short while at least! All we have to do now is hope the kayak hire people actually turn up!